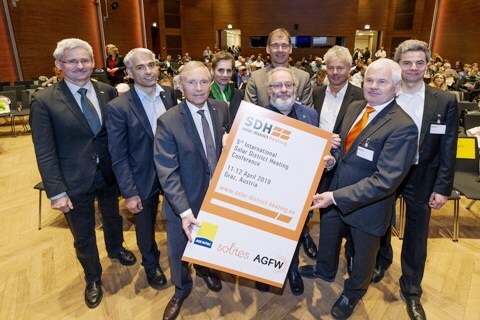 The 5th International Solar District Heating Conference, which took place in Graz, Austria, in mid-April, brought together 350 experts from 33 countries. It had twice as many attendees as the previous one in Billund, Denmark, in 2016 and attracted representatives from several development banks, such as the German KfW, the London-based European Bank for Reconstruction and Development and the World Bank via its group member International Finance Corporation, or IFC. The photo shows the conference’s supporters and its three organisers, namely Christian Fink (second from left), Austrian research institute AEE INTEC; Thomas Pauschinger (fifth from left in the back), German research institute Solites; and Werner Lutsch, Managing Director of the German Heat & Power Association, or AGFW for short (second from right). The SDH sector is heading towards a bright future. Lutsch emphasised in his keynote speech that “solar thermal and district heating have forged a sustainable bond.” Lutsch believes that solar thermal will – for the first time – contribute more than 1 TWh to district heating supply this year. Market forecasts for 2050 see the solar thermal capacity connected to district heating at 240 TWh or 15 % of Europe’s demand today. In 2018, the SDH conference easily accomplished what it set out to do: to bring together SDH system suppliers, decision-makers from municipalities and investors and provide them with an opportunity to conceive new projects. The main moderator of this business network was Christian Holter, Managing Director of S.O.L.I.D., a turnkey system supplier. “We’ve carried out SDH feasibility studies of 10 big cities in Eastern Europe and have also entered into partnership with the World Bank to invite stakeholders to Graz,” Holter said. The mayors and administrators from cities and municipalities in Albania, Bosnia-Herzegovina, Croatia, Kosovo, Macedonia, Montenegro and Serbia attended a World Bank/IFC workshop on Friday – just one day after the Graz conference, in which they participated as well. On top of this, seven solar thermal collector manufacturers and turnkey system suppliers – Savosolar, Finland; S.O.L.I.D. and Sonnenkraft, Austria; KBB, Germany; Absolicon, Sweden; and Arcon-Sunmark and Aalborg CSP, Denmark – showcased their products at an exposition in the conference centre. Graz is the capital of SDH in Austria and home to Big Solar, a EUR 200 million project to construct a 350 MWth solar field and 1.8 million m³ of seasonal storage. The target of Big Solar, coordinated by Energie Steiermark, a regional municipality, is for the city’s district heating network to provide a 20 % solar fraction throughout the year. Gerald Moravi, Managing Director of Energie Steiermark, had some good news to share at the conference: “We’ve found 11 hectares of land, so we can build the seasonal storage tank and have established a good working relationship with the planning authority.” This is one of the project’s important milestones, as land use restrictions around densely populated cities are regarded as one of the main barriers to SDH development. Moravi is confident that his company can also get another around 90 hectares, required for the collector field, in a water protection zone near the airport. A Wednesday afternoon tour to the multi-heat storage facility Helios in Graz provided insights into the complex task of managing heat demand and supply. 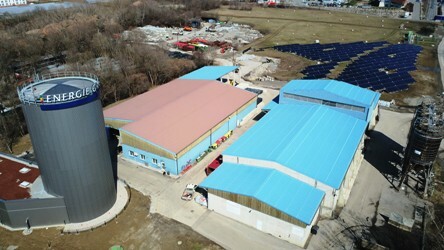 The project run by utility Energie Graz combines different heat sources, including a 2,000 m² flat plate collector field on the landfill, a 90 kWth power-to-heat system and a 170 kWth combined heat and power plant fired by landfill gas. Intelligent storage management and a 2,500 m³ tank make it possible to offset loads in the heating grad and give priority to renewables. The plant’s trial run started last November.